The inaugural Women’s Leadership programme began in December 2015, introducing eight exhibition participants to the programme and their mentors, acknowledged to be trail-blazers in the industry. Women occupy just 4% of top cinema jobs* and this programme represents the latest in the ICO’s commitment to diversify the exhibition workforce by tackling the lack of representation of women in top management positions in film exhibition. The intensive eight month programme will feature one-to-one coaching, work shadow placements, monthly skills development workshops and mentoring. Securing a place on the scheme has proved very competitive with applicants from across chains and independent parts of the sector, underlining the need to address these issues. 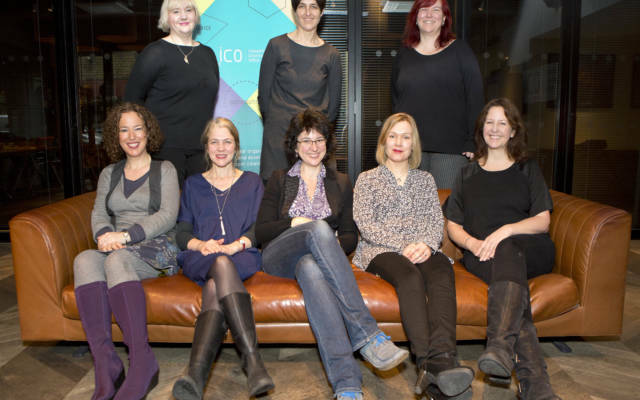 With 30 applications received from experienced women all over the UK who wish to work as a CEO or Director of a major venue or film festival, the ICO selected a group of eight talented and ambitious individuals at a similar level in their careers who will benefit from the programme. “The demand for places on this scheme shows that this is not an isolated situation. The lack of representation of women in top cinema jobs is a huge issue. Of course, it’s important to diversify the workforce at every level, but if you’re not at the top, you can’t make lasting and systemic change. We’re very grateful to see so many of the top women in film contribute to this group. It’s gratifying to see women at the heads of these organisations, but the stats show they are the exception, not the rule. It’s important that we recognise the contribution that these women have made to shaping the industry for the better. Our sector does not have a clear career path and sometimes promotion can seem too dependent on luck and connections. With this scheme, we wanted to create new networks that challenged this; not just between the mentors and the mentees, but between the participants. In production, creating a network is essential and women can see their careers grow side by side, but in exhibition, when you’re dedicated to one venue, it’s sometimes difficult to develop a network than can support you and give you the perspective of your peers. Deadline for applications is now closed. We hope to run the second iteration of the programme from summer 2016. Amanda was appointed Director of Development and Events of the British Academy of Film and Television Arts (BAFTA) in October 1998 and in December 2000 became its Chief Executive. Amanda was awarded an OBE for services to the film industry in 2009 and has received recognition in The Times’ British Film Power 100, the Women in Film and Television Power List and Women: Inspiration & Enterprise’s Power 50. Amanda is publicly credited with positioning BAFTA’s annual Film Awards ceremony as one of the most important of its kind in the world. With branches in Los Angeles, New York, Scotland and Wales and recent activity extending into Asia, BAFTA’s charitable message is now communicated to a global audience. Prior to joining BAFTA, Amanda worked as a theatrical agent and in television production. She was a company director at Duncan Heath Associates (part of the ICM group) between 1982 and 1988. Her television career began in 1989 when she worked at LWT. From 1990, Amanda worked extensively as a producer and development executive for Scottish Television Enterprises, both in Glasgow and in London, where her credits included three BAFTA ceremonies. Amanda joined the BFI in 2003 and has led its complete transformation into a major organisation valued by the UK industry and recognised as influential internationally. Her great focus is on nurturing the next generation of filmmakers and audiences and she has steered the BFI to lead the UK film industry in addressing an imbalance of diversity in front of and behind the camera. Amanda is an Honorary Fellow of the Royal Photographic Society and Fellow of the Royal Society of the Arts. She holds an Honorary Doctorate of Letters from Bradford University, an Honorary Fellowship from Bradford College and an Honorary Degree from York University. She was awarded a CBE in 2015. Lyn Goleby is a founder director of Picturehouse Cinemas and is Managing Director of the company. She also has an independent career as a film producer. She produced The Bridge, and executive produced Diplomatic Immunity and The Matchmaker. She became involved in funding the start up of City Screen (which became Picturehouse) in 1989. By 1992 this role had become full time as the company began to establish its credentials as a leading independent cinema operator. In 2003 Lyn, jointly with her business partner, was awarded an Entrepreneur of the Year Award by Europa Cinemas. Lyn served for 2 years on the Film Committee of the Arts Council England. Outside work Lyn served for 8 years on the board of Dance East whilst they built a new dance centre in Ipswich. She also serves on the Council of Tate Modern. She was on the Board of the Cinema Exhibitors’ Association until Picturehouse was bought in 2012 by Cineworld (listed on the London stock exchange) in a deal which involved an accelerated programme of growth. Briony Hanson is British Council’s Director of Film, responsible for promoting UK films and filmmakers internationally. Previously she has been co-Director of The Script Factory, Director of Tyneside Cinema, headed the BFI Programme Unit and co-programmed the London Lesbian & Gay Film Festival. She has conducted numerous onstage masterclass/interviews from Julianne Moore to Andrej Wajda, and is a regular guest critic for BBC Radio 4’s Front Row. Catharine has spent 18 years working in the exhibition sector for a variety of organisations including the BFI and Arts Council England. She has worked as a freelance programmer and arts consultant and progammed for festivals and cinemas both in the UK and internationally. She has lectured on film at a number of UK universities and is a regular contributor to industry events and a frequent filmmaker Q&A host. Catharine founded the ICO in 2003 and has been its Director ever since. Before taking up her role at mac, Dorothy spent 14 years at West Midlands Arts, including seven years as deputy director, working across a range of art forms. For 7 years till late 2009 she chaired the West Midlands regional Arts Council and served on the national board of Arts Council England. She is currently Chair of the boards of a number of charitable organisations, including the BBC Performing Arts Fund, Artrix – Bromsgrove’s Arts Centre, Motionhouse Dance Theatre and The Herbert Art Gallery and Museum, Coventry. She is a Council member of Birmingham Chamber of Commerce and a Board member of Dancefest Herefordshire and Worcestershire. In 2005 she was made ITV Central’s Midlander of the Year in the Arts and Media category and received an honorary doctorate from Birmingham City University, then UCE. Dorothy was elected a Fellow of the Royal Society of Arts in 2006 and received an MBE for services to the arts in the New Years Honours list 2011. Ginger Corbett started her career in the film industry as a production assistant before moving over to publicity. She joined Dennis Davidson Associates (DDA) and served on the board before leaving to set up Corbett & Keene with Sara Keene. They were international publicists on numerous television productions and films both in production and distribution building a formidable company which eventually became Premier PR, playing a prominent role at major cinema festivals such as Berlin, Cannes, Toronto and Venice as well as representing and handling press and PR for the LFF for a number of years. Ginger was the UK delegate for Spain ‘s leading film event, the San Sebastian Festival. Liz Leyshon has been Manager of Strode Theatre on Street, Somerset, since 1993, with responsibility for programming both live events and film. A 343 seat venue with a mixed arts programme, Strode lost all its local authority funding in 2011 but is continuing with a programme that is attracting support from all over the county. The recent addition of live screenings and the development of a Friends organisation have enabled Strode to survive and Liz is now working on the development and implementation of Screen 2, a 64 seat small scale venue in what was rehearsal and music rooms. The income for this project, totalling £170,000, has come from local trusts and personal donations from Friends of the Theatre. She has also project managed a £1.2million National Lottery funded extension to the theatre building in 1998; a production and tour of a new play in 2001; a revival of the same play at Southwark Playhouse in 2002; an exhibition of large scale portraits in 2005; produced a documentary film about Glastonbury in 2010 as well as numerous other smaller productions and projects with public and private funding.